The new Suzuki Baleno is a surprisingly spacious hatchback that is waiting for you to accelerate. The range includes the SZ3, SZ-T and the SZ5 which all have their own impressive features. No matter which model you opt for, this five-door vehicle offers both style and practicality which makes it the perfect option for an upgrade. The new Suzuki Baleno, the surprisingly spacious hatchback is available now from Motorparks Suzuki and Invicta Motors Maidstone Suzuki. There's no denying that driving the Baleno is smooth and enjoyable. Complete with a Boosterjet turbocharged engine, this vehicle brings you great, fuel-efficient performance. The lightweight body of the model means that you can easily navigate whether you're used to urban or country driving, and the torque is nothing short of impressive. Decide between a 5-speed manual or 6-speed automatic transmission for your preferred driving experience. You'll be pleasantly surprised when you see how well this five-door hatchback has been designed. Despite the compact size of the model, the interior has been carefully crafted to bring you as much space as possible and the lines of the exterior creates a sleek body that will undoubtedly turn heads on the road. Make no mistake that this compact hatchback has been designed with style and practicality in mind. Although recognisable as a Suzuki from its squared bonnet, this model brings something different with smooth curved lines and LED running lights. Stand out from the traffic with 16” alloy wheels, HID headlights and rear privacy glass. Choose from a selection of sleek colours and extra features for added personalisation. Open the doors of this compact model to reveal a comfortable and spacious interior that will heighten your driving experience wherever you're headed. Depending on the model you decide on, complete your interior with a glossy leather steering wheel, auto climate control and an advanced digital display. The sleek dashboard gives the feeling of more sports car than hatchback, and the touchscreen display brings you an easy-to-use navigation system, hands-free phone operation and smart phone connectivity. You certainly won't feel left behind when you hear about the technology installed in this vehicle. Choose the impressive SZ5 for a reversing camera, radar brake support and adaptive cruise control or enjoy comfortable air conditioning and navigation system as standard. It's safety first when it comes to the Suzuki Baleno. Put your mind at ease with front, side and curtain airbags, brake assisted function, ISOFIX child seat anchorages and a TPMS (tyre pressure monitoring system). Make this vehicle your own with a choice of three models which have their own stand out features. Decide on a selection of standout colours and opt for a manual or automatic transmission depending on your preferences. 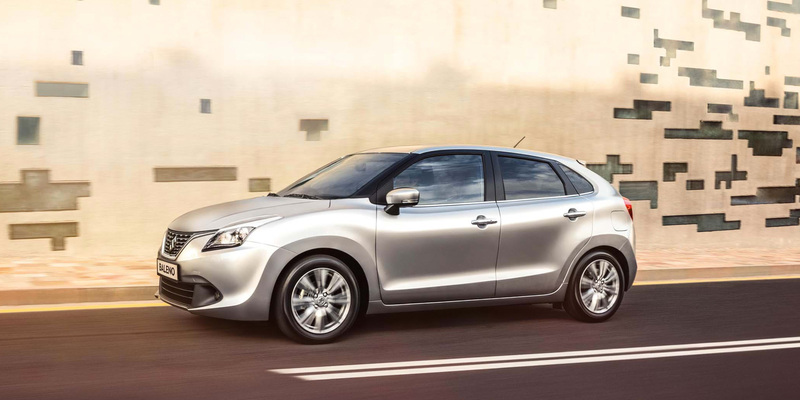 Find out more about the impressive Suzuki Baleno by visiting us at our Invicta Maidstone Suzuki dealership - part of the Motorparks family or enquire online today.